There are no suburban commuter passenger train/rail services within Christchurch or in the greater Christchurch area. There are no direct passenger train/rail services from Christchurch to Dunedin, Christchurch to Invercargill, Christchurch to Nelson, Christchurch to Mt Cook or Christchurch to Queenstown, except for daily direct scenic coach services that operate to Christchurch to Queenstown, either as a direct service or via Aoraki/Mt Cook national park. There are a range of combined train and scenic bus travel options to choose from, allowing you to make one reservation and travel on one fare from either Christchurch to Franz Josef or Christchurch to Franz Josef and Queenstown or from Queenstown to Franz Josef and Christchurch or Franz Josef to Christchurch. 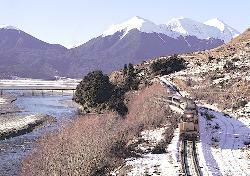 The TranzAlpine train travels between Christchurch, Arthurs Pass and Greymouth, from one coast of New Zealand to the other. From your carriage you’ll see the fields of the Canterbury Plains and farmland, followed by the spectacular gorges and river valleys of the Waimakariri River before ascending through the Southern Alps and descending through lush beech rain forest to the West Coast town of Greymouth – a great base for visits to Punakaiki and the always popular glaciers - Franz Josef Glacier and Fox Glacier. The TranzAlpine carriages are centrally heated in winter and air conditioned in summer, with 'Airline' style forward facing seats with head rests and 'Table Group' (4 people around a table) seating. Both styles allow you to experience the amazing views through large panoramic windows, while enjoying the company of other passengers on-board. The TranzAlpine has an open air viewing carriage allows you to get even closer to the stunning scenery and provides many opportunities to photograph your favourite spots plus a Buffet Carriage offering a range of hot/cold drinks, snacks and light meals on route. There are combined TranzAlpine and bus services from between Christchurch to Franz Josef or Christchurch to Franz Josef and Queenstown or from Queenstown to Franz Josef and Christchurch or Franz Josef to Christchurch. There are connecting bus and coach services at Greymouth to and from Fox Glacier, Franz Josef Glacier, Punakaiki, Westport and Nelson. The TranzAlpine train is reserved seating 'One Class/Non Smoking' service. The TranzAlpine train does not operate of Christmas Day - 25 December. Please click for timetable information and online reservations. The Coastal Pacific train travels between Christchurch, Kaikoura, Blenheim to Picton - the gateway to the Marlborough Sounds. Your journey is a scenic feast, with the Kaikoura mountain ranges on one side of your train and the rugged Pacific Ocean coastline on the other. Travel through some of New Zealand’s finest horticultural and farmland areas, plus seals and penguins from the comfort of your carriage. Along the way you pass though the village of Kaikoura, where you can break your journey to take in the whale watching or dare to get closer and swim with the dolphins. All carriages are centrally heated/air conditioned, with 'Airline' style forward facing seats with head rests and 'Table Group' (4 people around a table) seating, large panoramic windows, allowing you to experience the amazing views through large panoramic windows. The Coastal Pacific includes an open air viewing carriage where all your senses are awakened with the clean, fresh, sea air and a Buffet Carriage, offering a range of alcoholic and non-alcoholic drinks, snacks and light meals. There are connecting bus and coach services at Blenheim to Nelson. The Coastal Pacific train does not operate of Christmas Day - 25 December. The Coastal Pacific train connects with Cook Strait ferry sailings between Picton and Wellington.